This is a portrait I did for a fellow artist Dawn Thompson. 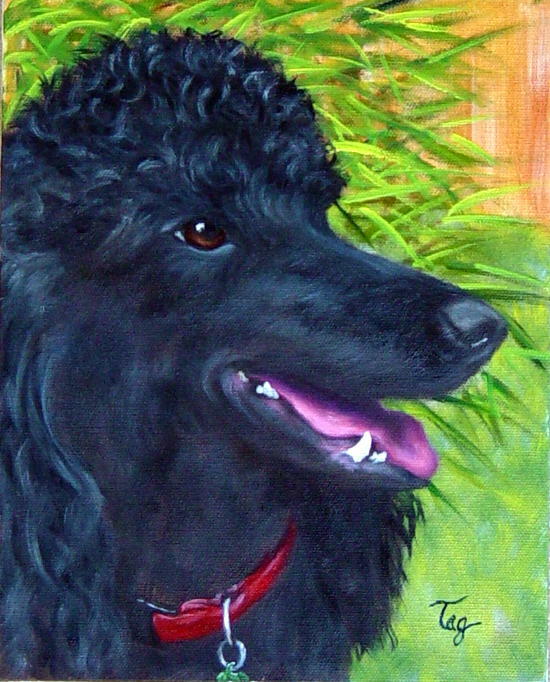 We were swap partners in the 2008 EBSQ pet portrait swap, and I was late getting her portrait finished and entered it into the EBSQ Better Late Than Never Show. 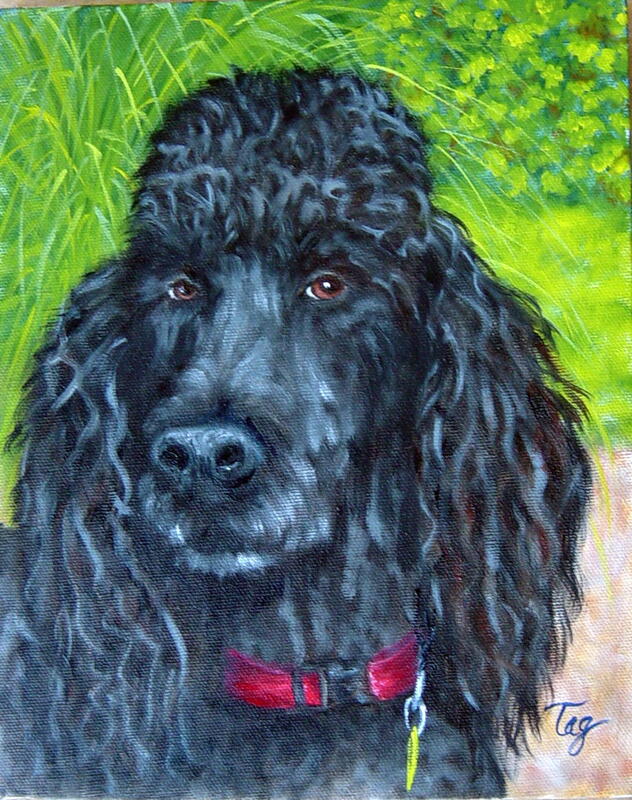 This is an oil portrait of her sweet rescued dog Lucy. I loved the photo ref of her snuggled on some beautifully patterned cushions and decided to paint her as such. 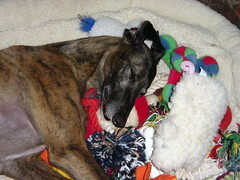 This dog has blossomed under Dawn’s care, I’m so glad she found her way to Dawn, for she is truly home now. This is 16×20 oils on stretched canvas. There’s still time to vote for your favorite piece in the EBSQ Late Show, a few days left, so get out there and see the great entries! It’s free to become a patron! This piece I finished on Christmas day. It’s a portrait for a fellow EBSQ artist, Heather Sims. We meant to swap dog portraits for the 2008 EBSQ Pet Portrait swap, and both got overwhelmed, so ended up finishing our portraits in time for the EBSQ Better Late Than Never Show. 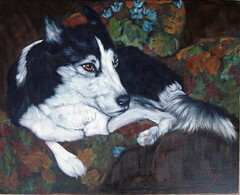 So, this is my entry and my portrait of Heather’s beautiful collie pup, Gumbo. We decided to swap as we both have dogs named Gumbo, though mine is a JRT. It was so much fun painting her Gumbo, he’s so lanky! I decided to put him on a fun size of canvas, this is an 8″x24″ stretched canvas. He’s done in oils, with a very limited palette, only titanium white, ultramarine blue, burnt sienna, and a bit of cinnabar. Feel free to visit the Better Late Than Never Show, and vote for your favorite piece, it’s free to become a patron of EBSQ! Only 2 more days to vote on this show! 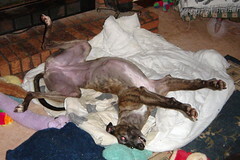 Oh to sleep like a greyhound…..though I have to say, I did wake up the other morning with my head hanging off the side of the bed, upside down. Now, how I got that way, I have no idea, except to think that I’m hanging around my dogs too much, lol! And this is Max, described as the goof. I loved painting them both! This one is 8×10 as well. new Nibblefest piece on Ebay! 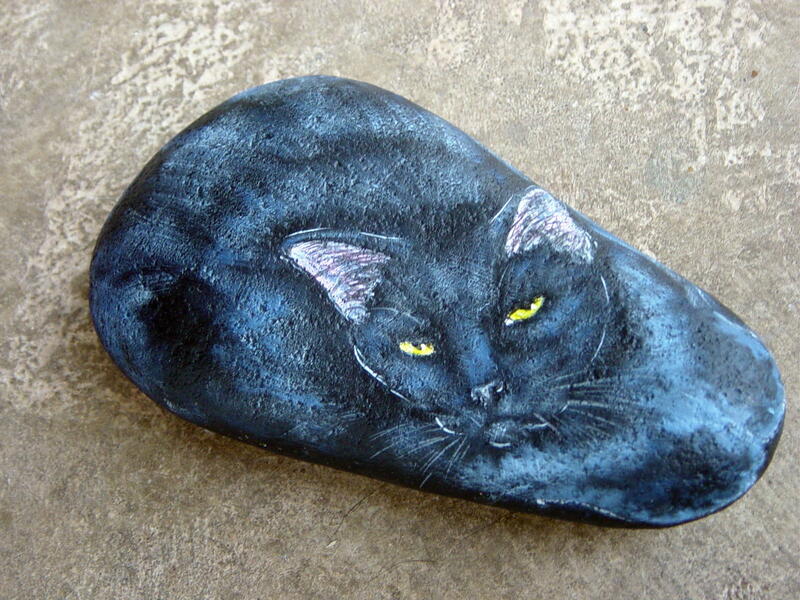 For the September Ebay nibblefest art contest, theme smiling black cats, here is my piece, a river rock portrait….it’s based on my rescued cat Charles, who has a lot to smile about these days. 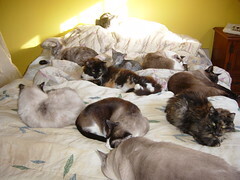 After all, not all black cats are as lucky. He spent a year in foster care, mostly because lots of people don’t give black cats a second look. I’m so glad I heard about this beautiful sweet boy. It’s only a 5 day auction, so, don’t miss it! And be sure to do a search on Ebay using “NFAC” to see lots of other great pieces for this theme!